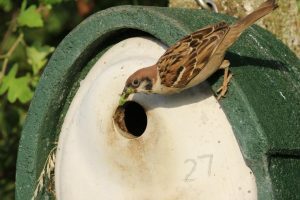 Nicholas Watts from Vine House Farm shares his experience of providing additional seed food for birds on his farm, and the benefits this has had for tree sparrows in particular. I am often asked do we really need to feed the birds? As someone who sells bird food I am bound to say yes, but we are only selling bird food because people asked me to sell them bird food when they came to see all the birds that I was feeding on the farm. Why was I feeding so many birds? Because they were hungry. And they were hungry because when you look across farmland today there really isn’t much food out there. In the 1970’s I was doing bird surveys for the Lincolnshire bird club and the British Trust for Ornithology but none of them were on Vine House Farm. In 1982 I decided to do a bird survey on our farm to record the birds breeding on the farm. I did the survey and have done it every year since but by 1992 I realised that there had been a big drop in numbers; skylarks had declined by 60% and corn buntings by 90% in just 10 years. This worried me, so I wondered what could be done about it. I started feeding birds in my farmyards during the winter months and I was soon feeding a lot of birds, up to 800, nearly all of them were buntings and finches. All these birds created a spectacle and I wanted other people to see this spectacle so I organised an open day. At that open day 2 or 3 people asked me if I could sell them some bird food. I hesitated but did sell them some. The next year I had the same spectacle so organised another open day. Again all the proceeds were donated to the Lincolnshire Wildlife Trust and again people asked me to sell them some bird food, there I was selling bird food without even trying. From the situation in my farmyards it would appear that birds need feeding during the winter months. Birds were not having a party, they were simply on the farm to eat food. These open days continued for another 10 years, and even though the birds had a surplus of food all through the winter numbers were dropping off. They left our farm in the spring, not because I stopped feeding them, but because they needed to return to all the various habitats where they liked to breed or where they were bred. 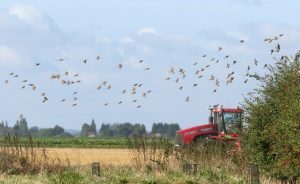 However there are problems out there for breeding birds in the countryside with crops often sprayed several times. Herbicides kill unwanted plants, and if we kill these plants there is nowhere for the insects to live, fungicides kill off foliar diseases which some insects live on and insecticides kill the insects that could be living on the crop. If this happens across most crops, there becomes a shortage of insects on farm land. Birds can’t take water to their chicks, so it has to be included in their food as either insects or unripe seeds. Fewer insects means less available food which is not very good for the survival of chicks, so unless there are sufficient insects in the countryside they will decline. About 10 years ago tree sparrows appeared at Vine House Farm, and so I started to feed them. I also erected nest boxes and numbers have built up. I feed them with red millet all through the year and we now have 175 nest boxes up. 150 of them were occupied and this year they reared about 1100 young tree sparrows. Our tree sparrows at Vine House Farm are an example of a population increase when there is a surplus of food – seed through the winter and insects through the breeding season. If we want to see a lot of birds we have to breed a lot of birds, feeding them all through the year. Posted in Seed-rich habitats, Supplementary feeding, Supplementary feedingTagged Supplementary feeding, tree sparrowLeave a Comment on Do we really need to feed the birds?